Note: I recently created a downloadable pattern for a lion mask. It’s a great choice if you love lions but you don’t want to hand-sculpt a lion’s face out of clay and cast it in concrete. 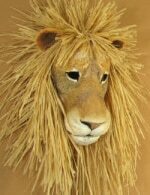 The downloadable lion mask pattern is made with cardboard pieces taped together, plus one layer of paper mache and that lovely raffia mane (made with a cheap table skirt). It isn’t waterproof, though, like the concrete lion in the video. I took some time off this weekend to work on a clay model that I can then use to make a concrete lion head for my garden wall. (The wall itself is still on the to-do list). When I asked if people would be interested in watching me make a latex mold that could be used to make concrete garden art, several people said “yes,” so I now have an excuse to make something I’ve wanted for years. I didn’t go into great detail on exactly how to sculpt a lion’s head – for something like that I need to find a better way to situate the camera. It’s way too hard to work around the tripod using the setup I have now. Maybe that’s also on my to-do list. Just love your website! So informative in such a personable, generous and smart way! Just one question, where does one buy the “Latex”. Would not think Lowes handle that, probably a sculpture supply place. Just wondered if you had a good supplier. you are just fabulous maam !! Lion looks great. You have great sculpting skills!! Thanks for the link back to the forum. You’re welcome – and as soon as I actually have anything concrete made, I’ll be back to visit your site. You have a great resource. That lion is gorgeous! How beautiful it would be to have it on a wall outdoors. I would love to work with concrete to make some outdoor figures. Looking forward to learning more and thanks so much for sharing! Hi Jonni-you are fabulous and you make it look so easy! 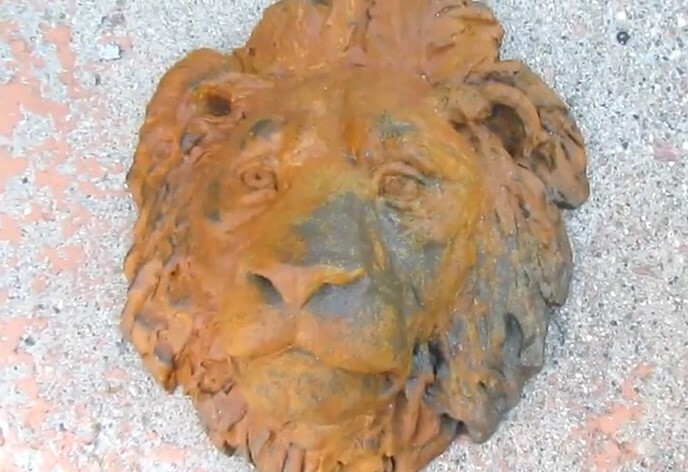 I love that you don’t want it too smooth- a concrete lion head should not be smooth! Questions for you- do you think the latex will stick to a paper mache mask that is varnished? I would love to try this when you put the tutorial up and I have a raccoon mask that I can live without if I ruin it. The varnish seems so slippery though. Have you said where you get the latex? Hi Eileen. The latex shouldn’t stick to a varnished paper mache mask – in fact, I intend to try that myself. But you would want to do a tiny test on an unexposed area first, just to make sure. The thing to worry about is not the latex sticking, but the moisture in the latex seeping into the paper mache and softening it. You can buy latex mold material at a hobby store, and for a small project that would be way less expensive than buying a gallon of the stuff online and paying for shipping. I bought mine at http://www.theengineerguy.com/Molding-Latex_2.html, but do remember that mine didn’t come with any instructions, and it’s so thick that the first few coats will need to be thinned with ammonia. I’m relying on some forum posts by other users, since the company doesn’t offer much help. This is the forum post that got me started on this whole idea. But really – for a mask, you’d be much better off getting a pint bottle from your local hobby store. If you try it on your mask, please let us know how it turns out. close to you.I love just browsing their sight to see all the different applications. Ironically, I have been cooking up some garden ideas for concrete as well, but I am in love with your lion head. I’m always excited to see an email announcing another post. They’re always interesting, informative and inspiring! I agree – the Smooth-on site is great, and they make really useful videos and tutorials. I used to live near a distributor, but I’ll have to check to see if there’s one around here. Thank you for sharing this with us – again, you are so generous! do you have experience making paper mache scultures that will stand outside in the garden? My one experiment with putting paper mache outside failed miserably, but other people have done it and they say it works. You would have to cover every part of the piece with some form of plastic — deck sealer, concrete sealer, UV-filtered varnish. And if there’s even a pin-hole left uncovered, I think that water and critters would find it. But, as I said, people do claim that their paper mache survives outside. I’ve wanted to do concrete garden art for years!! I’ll be watching every second when you complete the video. My neighbor used mortared cinder blocks and then covered them with mortar to create a curved garden wall. Just a thought for when you do your wall. I’ve painted concrete with thinned down latex house paint. It works great and, because it’s more like a stain, it doesn’t chip or crack. And, of course, wishing you luck. Linda, I hadn’t heard about the thinned-down paint idea. Interesting – I’ll tell my dad. What a great idea to go on this way, latex and the possibility of “copying” many times the same shape created is quite useful sometimes. We use it a lot in theater set design! As allways, a great video and explanation, Thank you so much Jonni!!! Lately I’ve been actually trying something related, but just the opposite way.. I’ve done this head piece (itÂ´s kind of “too serious”, but itÂ´s for a play) with a papier mache mix, planning to make with it a negative version in plaster, and then try some “copying”… do you think it could possibly work? I’m afraid the plaster could ruin the papier mache work? Carlos, this sounds very much like the way Douglas makes his theater masks. He has a lot of photos on his Flickr page, and he might have some more ideas for you. The plaster will soften the paper mache, though, if it isn’t sealed first. A good coat of shellac should protect it, but I’d do a test on something less valuable, first. Thanks Jonni!! I’ll take a look at Douglas page! OH Thank you Jonni for doing this. I am so excited. Can Not Wait to watch your process. Thank you Jonnie for doing this as well. I have always wanted to see this done. So, I am very excited to see the process. To speed the mold making process, you might try using a silicone with a thixotropic additive that prevents the silicone from running off the surface. It can be used on vertical surfaces and applied quite thick, and if necessary, additional coats can be added and will adhere to the coat underneath. With the addition of a plaster mother mold, you can finish the process in record time, and the mold can be used over and over for additional castings. I have used this system for years, and it has worked for me. Hi Gary. I agree that silicone is faster – but it’s also more expensive, and I was trying to find something cheap enough to play with. Not that latex is truly cheap, exactly, but it costs less than silicone. Do you have a website so we can see some of your castings?